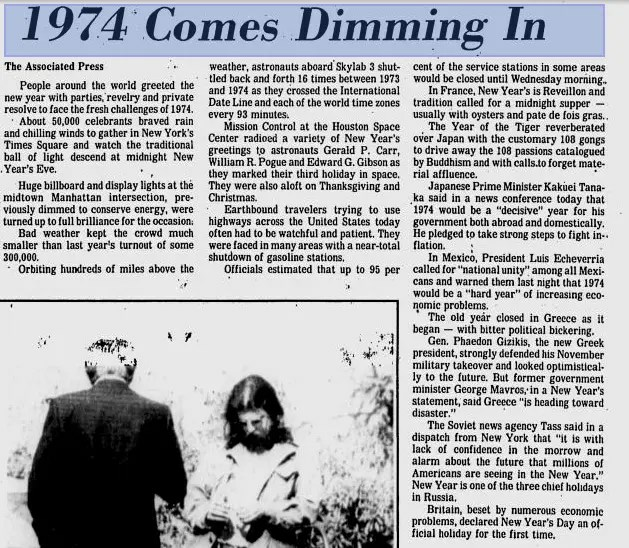 New Year’s revelry has come a long way since 1974. Forty years ago, 50,000 people showed up in New York City’s Times Square–“previously dimmed to conserve energy”–to watch the ball drop. Across the USA, thousands of gas stations were closed. The Soviet news agency TASS noted that Americans were ringing in the new year “with a lack of confidence in the morrow and alarm about the future.” And Great Britain declared New Year’s Day an official holiday for the first time. Moral of the story? Things could be worse! But also, it gets better (eventually).